Chester City: Danby, J.Vaughan, Kelly, Linwood (Roberts 45), Sandwith, Partridge (Rule 72), Hughes, Grant, Rutherford (Mitchell 55), Murphy, McManus. Subs not used: Palethorpe, Wilson. Macclesfield Town: Brain, Teague, Walker, Dimech, Reid, Reid (Edghill 73), Tolley, Ashton, Green (Evans 63), Rooney, Gritton (Blackman 63). Subs not used: Thomas, Creswell. 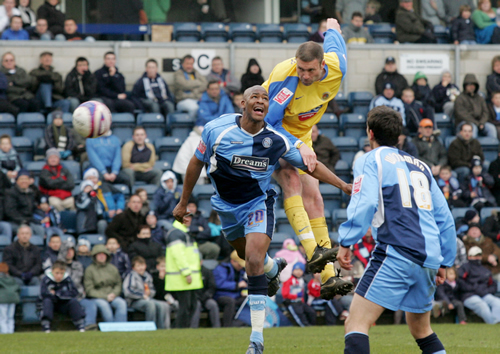 Chester’s 2007/8 season ended with a dismal game that matched City’s final League Two placing, a sorry third from bottom and with the worst home performance of any side in the division. It was really hard not to drift off in this match, as thoughts turned to the summer ahead, while both sides failed to impress and could only muster a 0-0 scoreline. City fans could at least relax because there were finally no looming relegation fears, but the crowd did little to add to the atmosphere either. Chester’s best first half chance came inside the first 10 minutes with a well-timed John Murphy pass to Richie Partridge. The Irishman only had the goalkeeper to beat, but his shot sailed over the bar. Soon after, Macclesfield had a near-miss when 17-year-old John Rooney, brother of Wayne, saw a thunderous strike hit the crossbar and ricochet out. It was enough to make several of the more boisterous 511 Macclesfield fans strip off to their waists! Other than a Murphy header which went reasonably close in the dying spell of the first half, there was little first half action to report. 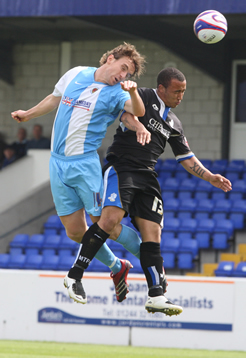 The second half saw City running out without captain and newly-crowned player-of-the-season Paul Linwood. He was replaced by Kevin Roberts. The final 45 minutes was very much like the first. 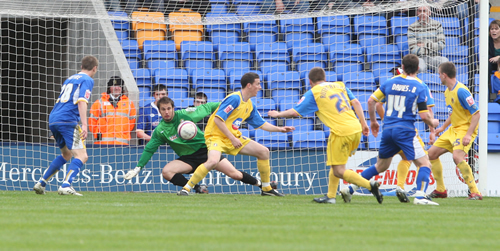 Paul Rutherford and Paul McManus both made threatening runs into the box, but neither went near the target. McManus was later named man-of-the-match, with Shaun Kelly also putting in a creditable performance. As both managers gave some of their fringe players a run-out as substitutes, including Andy Mitchell making his home debut for City, it seemed less likely a goal would be coming from either side. The announcement of four minutes’ injury time bought one of the biggest ‘oooohs’ of the day from the home crowd. 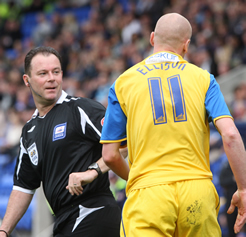 But referee John Moss did us all a favour and called time on the season about 90 seconds later. 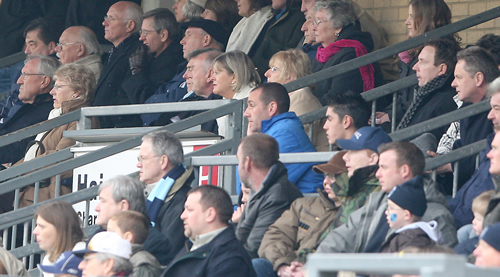 There followed a lap of the ground by the players, but no-one – either on or off the pitch – could really generate any enthusiasm and I can’t be the only one glad to see the back of the 2007/8 season. Now, when are the fixtures out? Chester City: Danby, J.Vaughan, Kelly, Linwood, Wilson, Partridge (Grant 57), Roberts, Hughes, Sandwith, Murphy, McManus (Rutherford 57). Subs not used: Palethorpe, Rule, Mitchell. Stockport County: Logan, Taylor (Turnbull 43), Owen, James Smith, McNulty, Pilkington, Blizzard, Dicker, Rowe, Dickinson (Proudlock 28), Lowe (Gleeson 45). Subs not used: Ruddy, Rose. It was a night of high drama and high blood pressure’s at Deva Stadium as City dug in deep to glean the solitary point required to maintain their Football League status for another twelve months. The relief on the faces of players and fans at the final whistle told their own story as City, who almost topped the table in October, scraped the point that saved their skins but relegated Mansfield Town in the process. 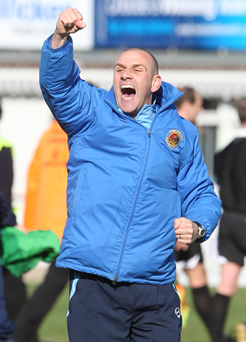 The Stags will join rivals Wrexham in the Blue Square Premier next season. This was a real team effort but at either end of the pitch two players stood out. In goal John Danby made a series of fine saves to deny the Hatters while at the other end John Murphy won almost everything in the air and ran himself into the ground for the cause. City had to do without Kevin Ellison who picked up an injury at Shrewsbury on Saturday and was replaced in the starting X1 by Mark Hughes. The Blues showed no signs of nerves at the start and had the better if the opening exchanges. Kevin Sandwith tried his luck from long range early on only to see his effort sail over the bar. Conrad Logan in the visitors goal then had to deal with Hughes header and from a poor back pass hit a wayward clearance against the onrushing Murphy that deflected wide of goal. 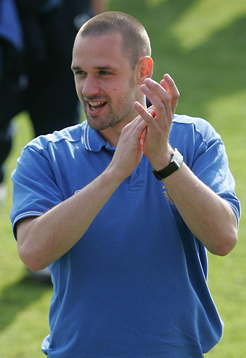 County manager Jim Gannon was forced to replace top scorer Liam Dickinson with Anthony Proudlock and would have to make two more changes before the opening period was over. The visitors failed to create anything of note and City faired slightly better as Hughes stooped to head over after Murphy had knocked down Laurence Wilson’s back post cross five minutes before the interval. In first half stoppage time, Wilson slipped and miscontrolled a ball on halfway and while he was on the ground ex-City player Ryan Lowe lunged in with a two-footed tackle that warrented a straight red card. Referee Woolmer produced a yellow but Gannon has seen enough and immediately withdrew Lowe. The second half began with Paul McManus producing a fine save from Logan after just 30 seconds as the young striker latched onto a pass 12 yards out after good approach play. That attempt appeared to shake the visitors up as they exerted themselves on the game and proceeded to carve out a few openings. Gary Dicker headed over from a good position as the City defence failed to cut out the cross from a free-kick. Twice Pilkington put Proudlock through on goal but on both occasions Danby came out to save well. There were appeals from the visitors for a penalty after Proudlock fell under a Paul Linwood challenge but referee Woolmer waved play on. 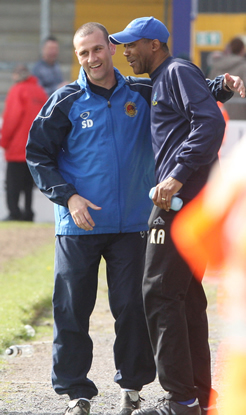 davies made a double substitution replacing Richie Partridge and McManus with Tony Grant and Paul Rutherford. 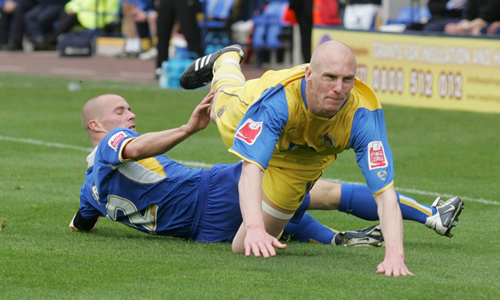 As soon as he’d come on Rutherford made a quick run down the right and forced a corner in front of the home fans. No sooner had the flag-kick been whipped in it was dispatched to the other end as County broke quickly and put the overworked City defence under immediate pressure. Logan still saw action at the other end though. Following another fine Rutherford run the Blues were awarded a free-kick on the right outside the area. James Vaughan swung in the cross and Murphy met it with a glancing header that the visiting keeper dived low to his right to save on the line. With nine minutes remaining the visitors looked certain to take the lead as Paul Turnbull’s cross was nodded on by Gleeson to Proudlock who saw his header from six yards superbly saved one handed by Danby. His reflex save pushed the ball into the air and he recovered in time to push the ball over as it dropped down towards the bar. Danby, named man of the match, made further saves from Gary Dicker and Tommy Rowe to preserve the precious point. City were being pushed back in the closing stages as the visitors looked for a winner. Agonisingly, twice in added time City gave away free-kick’s on the edge of their own area but on each occasion the ball was scrambled away before Woolmer blew his whistle to signal the memorable scenes of celebration and relief. Shrewsbury Town: Bevan, Herd, Kempson, Murdock (Leslie 63), Tierney, Humphrey, Moss (Hall 55), McIntyre, Davies, Hibbert (Constable 63), Madjo. Subs not used: Garner, Pugh. Chester City: Danby, J.Vaughan, Kelly, Linwood, Wilson, Partridge, Sandwith, Roberts, Ellison (Rutherford 39), Murphy, McManus (Hughes 81). Subs not used: Palethorpe, Grant, Rule. I’ve got to be honest and admit that this 0-0 scoreline reflected just what the game was – a bore draw, played out by two teams who both seemed almost incapable of finding the net. It would have been a fine performance at this stage of the season, had it not been for the Blues needing a win to help make League Two survival a near certainty. I’ll kick off with my biggest impression of the day – and that was the fine job that Shrewsbury have made of their new ground. Perhaps the April sunshine made it look even better, but it was certainly a stadium of which they can be justifiably proud. My second thought was that it was great to see an excellent turnout of Chester fans, with more than 800 in the away end, doing their part to remind the Blues that a win was vital. However, City did little to show that they were playing for three points. 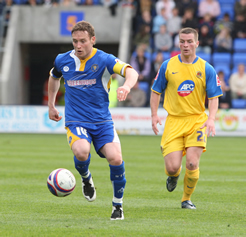 They started brightly enough, with Paul McManus running at the Shrewsbury defenders and having a shot in the opening spell. Shrewsbury were captained by Ben Davies and everyone knew when he had the ball, as he was roundly booed by the Chester end. 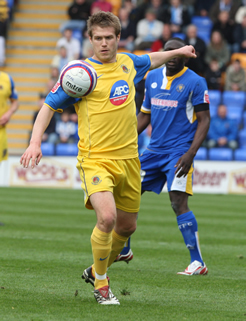 Both Davies and Kevin McIntyre, one of three ex-Blues in the Shrewsbury line-up, were able to get in some decent first half crosses. The closest they came to scoring in the first 45 minutes was when a Chris Humphrey strike was cleared off the line by well-placed Laurence Wilson. There was little else to report from the first half, apart from Premiership referee Rob Styles booking Kevin Ellison for dissent after he appealed for a free-kick. Shrewsbury missed a good chance to go ahead in the early stages of the second half when a good Humphrey cross was just missed by both Dave Hibbert and Guy Madjo. 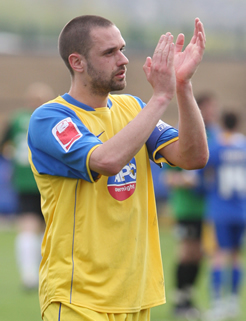 Paul Rutherford had replaced Ellison on the 39th minute, but he made little impression on the game. Chester had a half chance with a John Murphy pass to Richie Partridge, but the Shrewsbury defence dealt with the threat easily enough. McManus also looked dangerous when he skipped past a couple of midfielders, but he was stopped before he could pass a threatening ball. The best goalscoring chance of the day came when a Shrewsbury cross was met by an unmarked Madjo, but his header went over the bar. So it was a very uninspiring first visit to Shrewsbury’s smart new ground. As the tannoy announcer read out the other results when we filtered away past the police cordon, City fans realised that the point the team had earned was not enough to guarantee them a re-visit next season. I’d certainly like to go there again, and I hope the players feel the same. 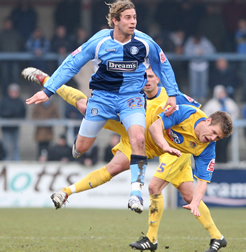 Wycombe Wanderers: Fielding, Martin, Johnson, Williamson, Woodman, Torres (McCracken 83), Doherty, Holt, Oakes, Facey, McGleish (Sutton 90). Subs not used: Palmer, Young, Stockley. Chester City: Danby, J.Vaughan, Linwood, Kelly, Wilson, Roberts, Hughes, Sandwith, Rutherford, McManus (Holroyd 68), Murphy. Subs not used: Palethorpe, Rule, Grant, Mitchell. Wycombe finished with all the spoils – a guaranteed spot in the play-offs – after a 1-0 scoreline at Adams Park left Chester seeking another point or two to secure League football next season. It was not for want of trying on City’s part, as a side fielding yet more youngsters put on a battling display, but failed to make the most of the chances they had. The first half was an undramatic one, with most action coming from around 11 corners, none of which led to any serious goal-scoring opportunities for either side. 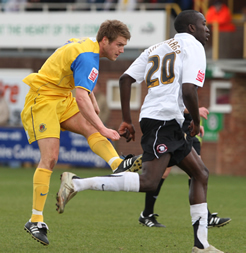 Wycombe’s stocky on-loan player, Delroy Facey, made for a threatening combination with 26-goal Scott McGleish. But the Chester defence, especially Sean Kelly, were a match for them throughout the first half. 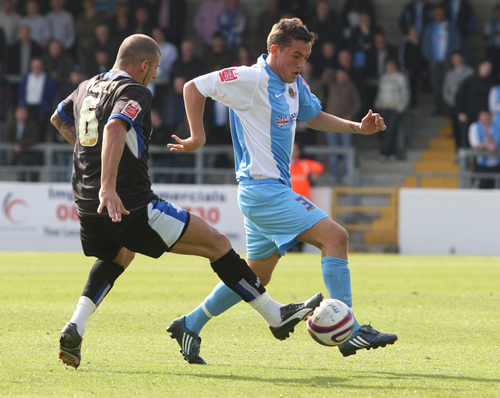 The closest Wycombe came to scoring was when a daisy-cutting cross raked in front of goal. It struck a City player on the way and could have gone anywhere, but went out for a corner. 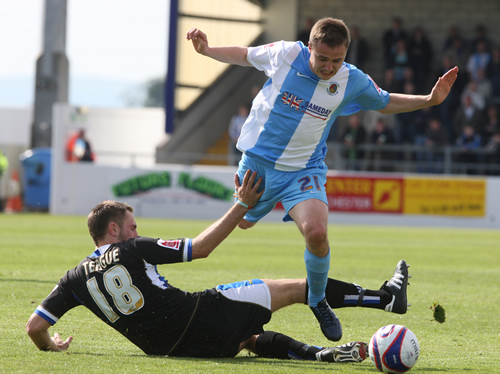 Chester’s best chance of the first half came when John Murphy ran into the box, but was tackled by a Wycombe defender. Kevin Roberts and Paul Rutherford also had shots which missed the target. City had two glorious chances in the second half. The first came not long after the re-start when a Murphy pass found Paul McManus clear on goal. He hastily tried to shoot over the ‘keeper, but blazed over the bar. Wycombe were coming more into the game and a great volley from Stefan Oakes (somehow ignoring the City fans taunting him with: “Showaddywaddy were cr*p”) was cleared off the line by Laurence Wilson. Chris Holroyd replaced McManus on the 68th minute and soon after the City fans, sitting in the corner of the BCUC stand normally reserved for home fans because the usual away stand was given over to a handful of Celtic supporters, were disappointed to see a Kevin Sandwidth corner go straight out of play without a chance of hitting a Chester head. 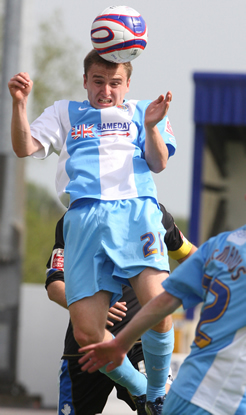 The impetus then seemed to switch to the Chairboys and they scored on the 76th minute after a free-kick found a free head, and the ball came to that man McGleish, who hit the ball home. City didn’t give up though, with their second great chance of the half coming on the 85th minute. A Chris Holroyd free-kick found Roberts clear about three yards from goal. He somehow shot over the bar and lay dejected on his back across the goal-line with his hands on his head. Chester had yet another corner, but it proved to be no threat. There were two minutes of injury time, but City could do nothing to conjure up an equaliser. With just 270 minutes of football left this season, they’ll have to find the net sometime soon. Chester City: Danby, Roberts, Kelly (J.Vaughan 45), Linwood, Wilson, Rutherford (Rule 70), Hughes, Sandwith, Ellison, Murphy, McManus. Subs not used: Palethorpe, Mitchell, Dinning. Lincoln City: Marriott (Duffy 16), Croft, Moses, Beevers, Ridley, Dodds, Frecklington, Pembleton (Hone 75), N’Guessan, Forrester (King 84), Wright. Subs not used: Brown, Stallard. Chester suffered their 13th home defeat of the season after failing to capitalise on numerous chances created through the 90 minutes. Once again injuries forced a reshuffle of the squad with Paul Butler and Richie Partridge missing through injury, with youngsters Shaun Kelly and Paul McManus deputising. The Blues were given a dream start, the game was only four minutes old when they were awarded a penalty after Imps ‘keeper Alan Marriott had brought down John Murphy in the box. Kevin Ellison, who scored from the spot last weekend, stepped up but hit a weak effort down the middle that was comfortably saved. Chester continued to have the better of the opening exchanges and Paul Linwood and Mark Hughes both brought out saves from Marriott. Soon after Hughes missed a great opportunity to open the scoring after being set up by Ellison. On 16 minutes Marriott had to leave the field with a hamstring problem to be replaced by Ayden Duffy, four minutes later he was picking the ball out of the net. 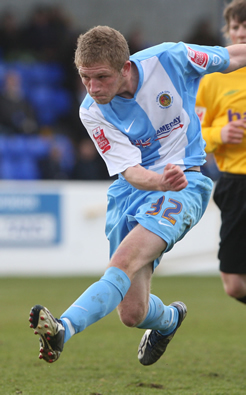 Paul Rutherford broke down the right and crossed for McManus to lift the ball past Duffy for his first goal for the club. City’s joy was short lived however, a minute later the scores were level. Dany N’Guessan found Jamie Forrester and he shot home from six yards out. Two minutes later Forrester was on the mark again to take advantage of some poor defending as the steered the ball past Danby following a precise Ben Wright cross. Danby, making his 100th appearance for City, did well to save from Louis Dodds to keep the deficit down to one. Ellison forced a save from Duffy and Hughes saw an effort slip wide as City finished the half strongly. The Blues introduced James Vaughan for Kelly following the interval. On 69 minutes the visitors were reduced to ten men as N’Guessan was sent off for a second yellow card after a foul on Laurence Wilson. City continued to press but couldn’t convert their chances into goals. 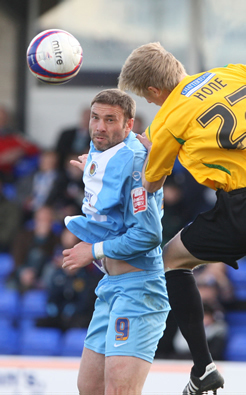 Glenn Rule replaced Rutherford before both Ellison and Paul Roberts missed chances to equalise. Twelve minutes from time Roberts saw a shot crash off the bar from close range. In the latter stages the Blues continued to be wasteful in from the of goal. Ellison, Paul Linwood and Murphy were all guilty of misses, Murphy’s being cleared off the line, as the Imps held out and City were left to rue all those missed chances. Hereford United: Brown, McClenahan, Beckwith, McCombe, Rose, Igoe (Johnson 67), Smith, Diagouraga, Easton, Hooper, Guinan. Subs not used: Esson, Robinson, Taylor, Collins. Chester City: Danby, Roberts, Butler (Kelly 45), Linwood, Wilson, Partridge (McManus 41), Sandwith, Hughes, Rutherford, Murphy, Ellison. Subs not used: Palethorpe, Rule, S.Vaughan. It’s been a long while coming for this exiled football fan – but, at last, a Chester match that I enjoyed and won’t want to forget in a hurry. This valiant 2-2 draw was witnessed by just 190 travelling fans, a far cry from Edgar Street encounters of recent seasons. But they were treated to a second half display to match the drama of those heady days. 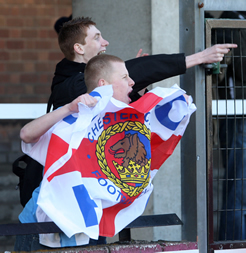 The first half was not so enthralling from a Chester perspective, but offered reasonable entertainment value. City started with Kevin Roberts filling in at right-back and within moments of the kick-off he made his presence fault with a foul on Steve Guinan. 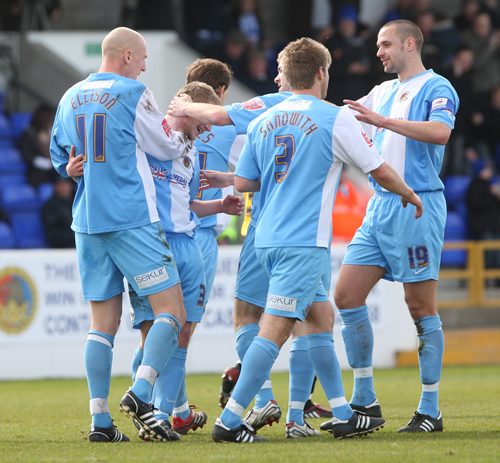 The free kick was wasted, but Hereford were soon pressing forward – with their strikers running very close to offside. The first 20 minutes saw most of attacking action coming from the Bulls, and Paul Linwood was in the right place to block a goalbound effort from Ben Smith. Chester did have a couple of chances, with Wayne Brown doing well to hold onto a Richie Partridge strike and John Murphy somehow blazing the ball over the crossbar when he had a one-on-one chance to make it 1-0. But the first goal went to Hereford after some ‘head tennis’ around the box, when the ball came out to Smith, who ran past his marker to score well past John Danby. There was a suggestion of offside about the goal and some of the City fans made their feelings known to the linesman. He was under fire again 10 minutes later when Gary Hooper ran onto a through ball, when there seemed to be at least one Hereford player in an offside position. Hooper took his chance well and it remained 2-0 to Hereford when referee Phil Joslin blew for half-time ten minutes later. Chester emerged for the second half with Paul Butler replaced, through injury, by Shaun Kelly. Paul McManus had already replaced Partridge on the 41st minute. City seemed more determined from the start, with Kevin Sandwidth having a shot on target, which had to be tipped over by Brown. Kevin Ellison was showing more aggression and was booked on the 50th minute – ensuring he was roundly booed throughout the rest of the game by the Hereford faithful. Young McManus was given a tough time by the beefier Bulls defenders, but he had a decent shot blocked. Soon after, Paul Rutherford had a strike held by Brown. Chester were very much on the attack, with even Sandwidth pushing forward. It was just as well, as the ball came to him on the 67th minute and he curled a perfect 25-yard shot into the left-hand corner. The fightback was on! As Chester drove forward, they were caught at the back again by Hooper. But Danby made an excellent stop to keep the score at 2-1 and the attention soon switched to the other end. 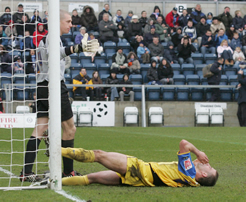 Chester won a corner in the final three minutes of stoppage time. Murphy almost equalised when his header struck the crossbar. But when the ball went back into the box there was a handball by Richard Rose and the referee gave City a penalty. Brown did his best to put Ellison off his spot-kick. But it was to no avail and ‘Super Kev’ blasted it perfectly to give the Blues a precious, and deserved, point. I’ve a feeling we’ll be back at Edgar Street again next season, and I’m looking forward to another classic encounter already. I’m not usually let down.